About ... on the side of a very old fire truck. Hi Pierre. It's great to see your picture on the Home pAge. Pierre, congratulations on Donor Image of the Day award, very well deserved. Thanks for the kind words on reviewing my picture, Roberto! Very interesting shot. Great composition. Hey, Pierre. Congratulations on making the front page as the Featured Donor! Congrats on the feature donor!! hello pierre a nicely shot metallic and working! I like it, best congrats for the featured donors! Thanks for your company on that trip. Looking forward to more. Thanks again Mary! 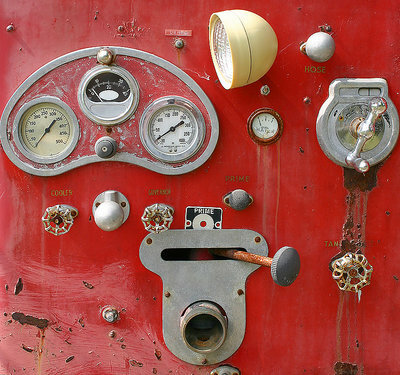 There's lots to neat things to see on these old fire trucks. Very interesting image. It certainly tells a story. Great idea! Very neat, Pierre. Great capture. I didn't realize there were that many things on the side. Nice old retro feel, those woulda saved lives!